Okay, okay, so the title of this post was stolen from Depeche Mode, but it has nothing to do with their song. I am here to say, while you may not be judged by the shoes you choose to walk in on your wedding day, you certainly will be photographed in them! Fashion comes before comfort until the photo shoot has wrapped, so please make sure to choose wisely. Okay, so maybe they were the stars of the show! They were well captured anyways by Calgary photographer, Chelsea at Shutterbird Photography (http://www.shutterbird.ca/). Footwear photo's are a huge trend in wedding photography right now and a wedding album is just not complete without a few whimsical shots of the kicks you have chosen. This post could literally go on for days with the number of incredible shoe shots out there, so I will choose just ten and count down to my all time favorite shot, it won't be easy but here it goes, enjoy my fashionista friends! Ah, an ode to cowtown, one of my favorite pairs of shoes in my closet are my cowboy boots. 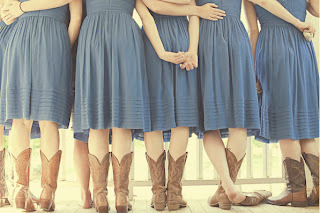 This photo is so gorgeous it has a light, vintage country feel to it, the chestnut boots complement the uniform blue dresses wonderfully, and unlike some other cowboy boot pictures I found, these are really showcased in a tea-length bridesmaid frock. Not only are these unique and photograph beautifully, they sure as heck are good for a whole night of dancing (I would know!). 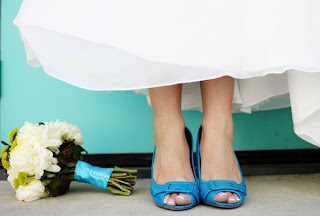 This pair of beautiful feet grabbed my attention, and I don't know if it was the reflective sheen of the grooms patent leather or the chic hippy satin shoes of the bride, but I love this shot. It was taken in Orange County by the very talented Natalie Moser. The wedding was outdoors with shades of green and purple, accented with black and white. Lovely shot, I love how the colours are tweaked just enough to get that warm summer haze feeling. Those shoes are to die for and I might need to go on a hunt for them when my time comes! Susan Stripling lives in Brooklyn, New York and therefor shoots some in Brooklyn as well as all over the New York City area. Why do I mention this? Because I can't think of anything more modern or fashion forward than a New York bride! 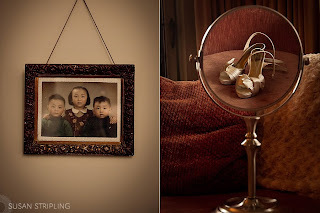 That being said, this photo with the reflection of the bride's gorgeous ivory satin peep toes is gorgeous, the fabric textures paired with an old family portrait are so vintage chic and I love the warm colours. 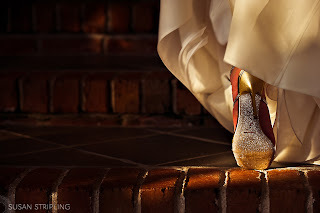 A great creative view of the shoes the bride will wear while promising her life to her new husband. No other favored shoe choice of mine will get me more grumbles than the love-to-hate UGG boot, but this is my blog and so I get to choose, he he. There is no other shoe in my closet I love more than my chocolate brown UGGS that Josh bought for me a few Christmases ago. They are cozy, soft and comfortable, and honestly, I actually don't think they are ugly at all. If I were to have a winter wedding there would be no other shoes I would rather wear than my beloved UGG boots, see how cute and cozy they look? Love them or loathe them, at least this bride will be band aid free by the end of the night! 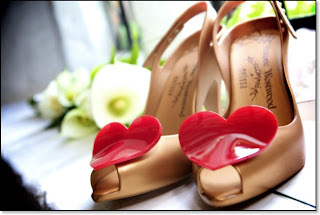 Wow, what a bride to pick such a bubbly and very fittingly themed shoe for her big day! These are just about the cutest shoes I could imagine and Peter Kelk of Maldon, Essex photographed these hot little Vivienne Westwood numbers beautifully! I adore couples who don't take themselves or their wedding day too seriously, besides, it is about the couple, who they are as a team and who they will be as they grow old together. 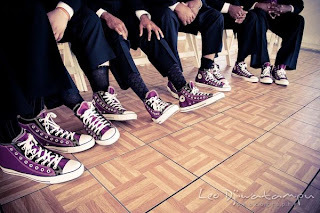 These timeless and oh so comfy Converse sneaks make for a happy bridal party and fun and whimsical images of the big day. My obsession with the apple green wedding shoe began long ago when I started seeing shoes in the bridal scene that were different from the traditional white or ivory. For a long time I thought apple green shoes would do it for me on my big day, who knows really as I change my mind about colour palette's every day, but this image is just gorgeous. You can sense calm, yet a great anticipation of what's to come, just with the slight bend of the ankles. In the last few years, feathers have taken the wedding industry by storm. Fascinators are the must have item, clutches with peacock feathers adorning them, huge plumes of ostrich feather bouquets as centerpieces and even the wedding dress industry has caught the feather fever creating fun and floaty wedding gowns. One thing I have not seen a lot of yet is feathers hanging out on shoes. This may be because of the impracticality of keeping feathers clean, but it is after all "just one day" as everyone will keep reminding you! Something old, something new, something borrowed, something blue. Well these gorgeous, vintage inspired pumps can take care of several of these items! 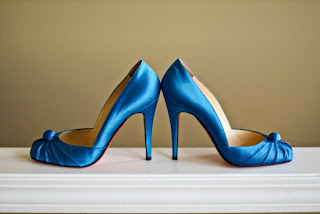 Not only are these a fun and bright colour, coordinating with the satin ribbon on her bouquet, but they are a lower heel so the comfort factor is there, which is always an issue. Buying fancy, expensive shoes is one thing, but keeping them on is another! I think this bride did a great job in choosing her peep toes! Well, here it is - the number one image in wedding footwear that I found. I chose this pair of "glass slippers" because I find it the epitome of a little girl dreaming to one day to be just like Cinderella and find her Prince Charming. While they may not be breathable or even very comfortable, they sure do make for a beautiful shot and quite the statement on your big day. Well, there you have it, my top ten (actually, eleven if you count Danielle's pretties!) 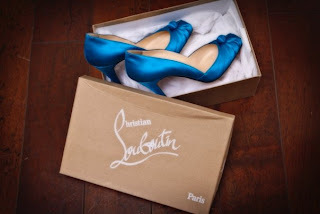 wedding shoes and wedding shoe images. As you can see, not all of these are big designer labels, that is not always what counts. Sometimes it's just a vibrant colour or hypnotic pattern that will make you know that pair of shoes is "the one".